The good news is that Banks is already on top of it. 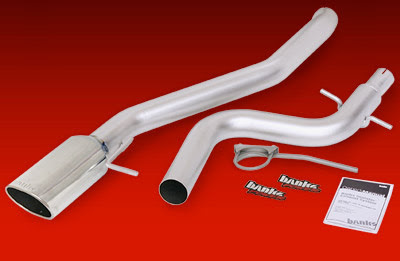 Currently offered under Banks Power Products are their Monster Exhaust System, which will boost your hp, torque, and fuel economy. But this is old news, and there's already so many alternatives to their exhaust system. So if their Monster Exhaust doesn't offer significant improvements compared to lesser quality aftermarket exhaust components, then why buy Banks? A Banks Six-Gun Engine Tuner + the Banks iQ Display/Interface. So the real question is "why can't I get all this yet?" The final word, it's still in the final stages of R&D. Nobody really knows when Gale Banks will finally release these components, but one thing's for sure - if you own a TDI and you're just learning about this now, you're probably hanging on the edge of your seat screaming like everybody else. Rumor has it that this complete kit won't raise your peak power by much, but will instead widen your power curve for a lot more low-end pop and quicker turbo spooling. So if you're wondering if you should buy Banks Power Products for your Volkswagon Diesel TDI, the answer is simple. If you can wait, then wait - without a doubt, Banks' kit will be the beezneez, and will most likely wipe out their competition. But if you want more than an aftermarket exhaust for your TDI right NOW, there are other manufacturers that produce full kits for your TDI already. So... you gotta do what you gotta do.